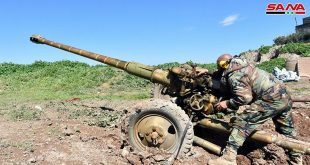 Hama, Idleb, SANA_ Syrian Arab Army units, over the past few hours, foiled terrorists’ infiltration attempts towards the military points in a number of villages and towns in the countryside of Hama and Idleb. 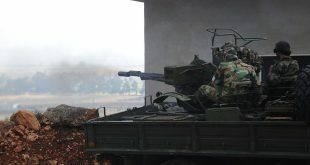 SANA reporter said that army units centered in Bridij Camp in Meharda northwest countryside in Hama targeted terrorist groups while trying to infiltrate from al-Janabera village towards one of military points in the northern countryside, killing and injuring many of the terrorists. The reporter pointed out an army unit working in Talet al-Hammamiyat in Meharda northern countryside carried out an operation on the direction of infiltration and movement of the so-called “Kataeb al-Ezza”-linked terrorist groups in the vicinity of Tal al-Sakher village. The operation ended up with thwarting the infiltration attempt and forcing terrorists to retreat and flee towards the depth of the village. 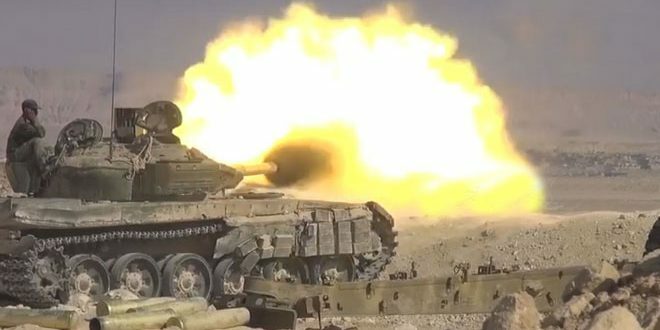 The reporter said that the army units centered in al-Masaseneh carried out precision strikes on the positions and directions of the infiltration of terrorists on the outskirts of Ma’rkabeh and Lahaya towns, about 25 km north of Hama city, killing many terrorists. “ Kataeb al-Ezza” terrorists have acknowledged the killing of Alaa Daaboul, one their leaders, who was injured by the fire of the army units during confronting terrorist attacks in the vicinity of al-Zalaqiyat village last Friday. Next Homs Police Commander to SANA: 6 civilians injured due to explosion of bomb inside a passenger bus in al-Siteen Street in al-Zahraa area.